Hey, arrow fans what is up!! So, Arrow episode title Level Two let’s dive right in these moments from the episode. 1. Felicity goes to Laurel for help. I love the scenes with Katie and Emily I have been dying for them to have more scenes with each other since season 3. It was not fair that Laurel and Thea had more scenes with each other than Felicity and Laurel. I love that despite the darkness Felicity still has her sense of humor. Going to Black siren was like her only option because she wants to kill Diaz for Quentin. 2. Roy and William in future Star City. Can I say I am more interested in the flash-forwards than present day? So, William and Roy show up in Star City and believe me it looks like hell. Star City looks like it is in the middle of an apocalypse. And Roy says; “Star City has seen better days” Uh Roy no it has not because if it has the City would not look like crap. You can tell it’s an apocalypse because there is a resistance, a resistance screams apocalypse. So, off Roy and William for a second because of what Roy and William found out that Felicity is dead!!! Wait my question would be who died first? Because if Curtis lasted longer than Felicity then something is wrong. Also, you’re telling me that Dinah outlived the rest of team arrow that’s impossible. I find that wrong on so many levels it is the end times in the future. 3. Oliver time in Level Two. You guys it is not looking good for the Vigilante right now. They are trying to brainwash Oliver it is like season 3 all over again. I mean they were trying to make him see his father was a murder and that he does not have to go on this vicious cycle. Oliver is in deep water, mud, (I’m trying not to cuss, but you get what I am trying to say). 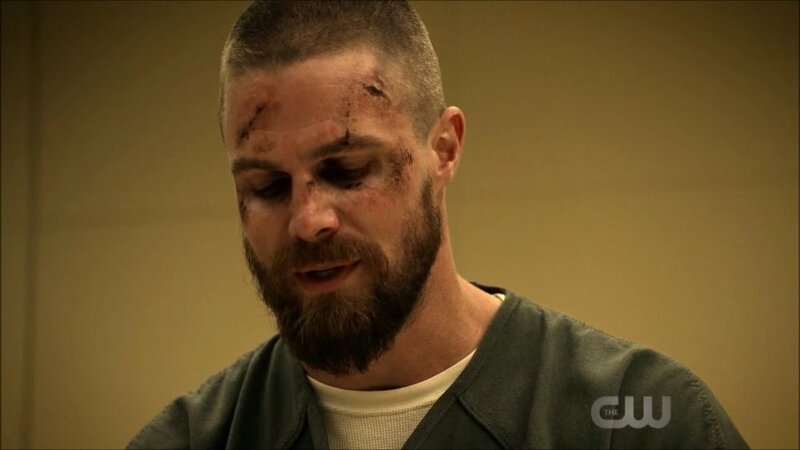 Next episode is going to be worse, so all you Oliver fans out there get some tissues or a shoulder to cry. 4. Laurel encourages Felicity not to cross the line. I want Felicity to cross the line, but I get it because Felicity is this fun likable character that has this light inside of her. Everyone else can torture or tend to kill someone. A character like Felicity does not have that sort of mindset. She has the fire in her eyes but can she bring herself to cross that line. I mean you cross that line there is no going back it will be hard for you to be yourself again. It is true because torturing someone is like taking a little bit of your humanity. I love that Black Siren convinced Felicity not to cross it because she sees that Felicity is a good person. 5. Dinah and Rene Help the Green Arrow. I know they are trying to redeem Rene, but I’m still not feeling it. So, I love that he helps the new Green Arrow escape Dinah and all that took a lot of guts knowing you will get arrested. Dinah needs to stop trying to make people believe in the cops. Those days are gone because most of the police on the force were dirty over the years. To be honest when the city went to crap who save the people it was not the police I can tell you that. Why wait a few days for someone to get just when a vigilante can do it in a matter of minutes. Dinah changing her mind and decided to let the Green Arrow go nice. I still think the Green Arrow is Roy. Now some people believe it is Oliver’s half-sister, If it was I’m sorry but did you hear the voice modulator that’s a dude under there. If it is a female which I do not see how because the way the suit is fit on the body. I hope you guys enjoyed this. Can't wait for the next episode see you next week, overall rating 8/10. who do you think in under the hood? Who would you like it to be under the hood? Can that guy really break Oliver? Do you like the flash-forward this season?